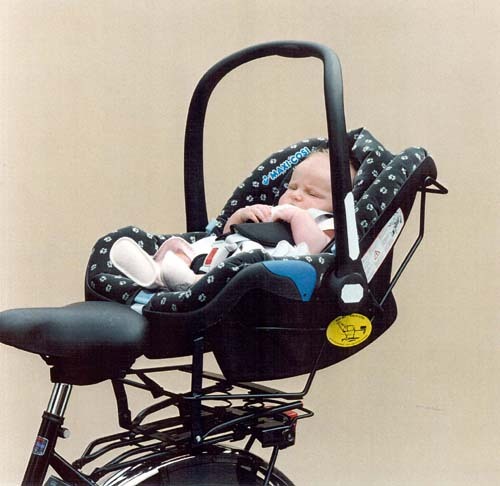 Does anyone have any experience or references on when it is ok to start putting a child in a bike child seat/carrier? I am aware that our child will need some extra neck strength to not bobble around too much with the added weight of having a helmet on his head. ...children under 1 year of age should not be on bicycles. Children are just learning to sit unsupported at about 9 months of age. Until this age, infants have not developed sufficient bone mass and muscle tone to enable them to sit unsupported with their backs straight. Pediatricians advise against having infants sitting in a slumped or curled position for prolonged periods. This position may even be exacerbated by the added weight of a bicycle helmet on the infant’s head. In some US jurisdictions it is illegal for children under the age of 1 to be passengers on a bicycles as well. If you use a trailer its pretty much the same as using a pushchair (stroller) and indeed some double up (I wouldn't get one that doesn't) - you'll get a 5 point harness, a seat that reclines and you can get head cushions and the like too. Of course a trailer may not be practical in your circumstance (though I'd be surprised) but if it is it also helps deal with the problem of all the other stuff you want to carry when going out with a small child. In the Netherlands the accepted age for first bicycle rides is about 9 months. The main point to watch out for is that many bicycle seats are a bit big for children that age so you have to take special care they can't bounce or climb out. If you have a cargo bike you would typically use one of these for your baby.